Sleepy Hollow is a quiet little town in the Hudson Valley. A quaint village steeped in history turns into a destination of horror for all lovers of Halloween. If you decide to make the drive to Sleepy Hollow and nearby Tarrytown make sure you give yourself at least two days for all of the festivities. Since I was a kid I have been both fascinated and horrified by the story of Sleepy Hollow. The Headless Horseman is one of those iconic images of Halloween. Written so beautifully by Washington Irving, the town of Sleepy Hollow has embraced its legend. In this fantastic short story a school teacher, Ichabod Crane plays cards for the hand of his love Katrina. After loosing, he rides home forlorn. On his journey, he is pursued by the ghost of a Hessian soldier who had lost his head in the revolutionary war to a cannonball. The headless horseman, we are led to believe, runs down Crane and he is never heard from again. Chills! With a story like this who wouldn’t want to see the place that inspired such a tale? And Sleepy Hollow provides the entertainment to enhance your Halloween trip! Here are a few of the more interesting events. This is a must see! 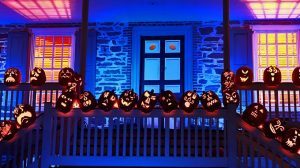 Every year, from the beginning of October through the first couple of weeks of November, Van Cortlandt Manor is lit up with over 7,000 Jack-o-Lanterns. Pumpkins are carved into a variety of themed sculptures, everything from dragons to the Headless Horseman himself. Photo from the Horseman’s Hollow Facebook site. One of the scariest attractions in the area. Phillipsburg Manor is transformed into a recreation of the Legend of Sleepy Hollow and then some. You start by being pursued by the Headless Horseman down a deserted lane, then upon the trail, you are met by all sort of ghoulish fiends. This attraction occurs in the heart of Sleepy Hollow but is not for the faint of heart. 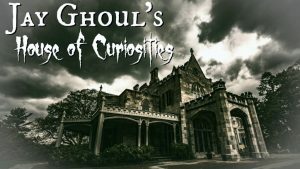 For a twist on a haunted house for all ages, visit Lyndhurst in Tarrytown.This variation on a murder mystery leads you on a tour of the mansion while giving you clues to deduce, who committed the murder. The gothic revival style house is the perfect setting and fans of the classic Clue, will enjoy this tour. There are other things to do if you aren’t in the Halloween mood. You can take a self-guided tour of Washington Irving’s landmarks around Tarrytown. Once you’ve worked up an appetite head over to their farmer’s market on Saturdays at Patriot Park. If you’re a Music fan, Tarrytown host a Jazz Forum every weekend throughout the month of October. 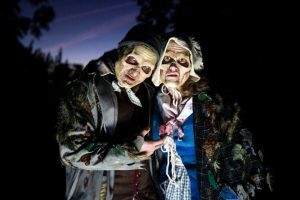 This Halloween spend it in style with a mix of Hudson Valley culture and kitschy horror in Tarrytown and Sleepy Hollow. What is your favorite place to spend Halloween? Do you have a go-to destination? Let me know in the comments! Until next time.